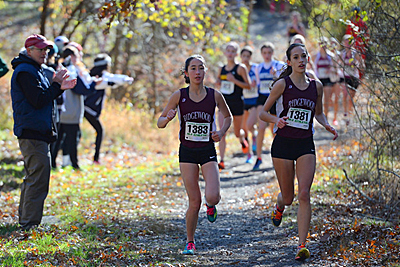 The Sectional Championships are behind us and the field has been narrowed to 80. the Five fastest squads from each Sectional Race are now en route to the Group Championships at Holmdel Park this Saturday. There were some surprises, but no real shockers as The Ladies started on the trek to the MOC. Red Bank Catholic still rules the roost, but the shuffle to find the best of State continues. Take a look at what happened to the Top Ten last week and start the countdown to the best two Saturdays of the season! 2 Ridgewood 85 1 4 Winners @ No. 1 Gr. 4 Terrific 1-2 punch with solid back up cast. 10 Rumson-Fair Haven 10 NR Victors in CJ Gr. 2 Race They know how to race…especially at Holmdel. 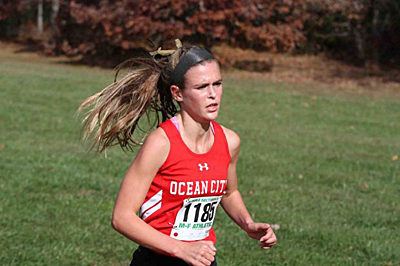 Epiphany Grisbaum (Ocean City HS ’15) – Epiphany Grisbaum has had a great season so far and heads into the Group Championships on a roll. Grisbaum, who recently announced that she will continue her academic and athletics career at Vanderbilt University, won the SJ Group 3 Championship with a time of 18:01. Her mark was the fastest time of the day over the Delsea Reg. HS layout. Good to see Shawnee Girls getting into the top 10, although I don’t know why they are not ranked ahead of Haddonfield. Won the merge at Delsea and had a better average time. 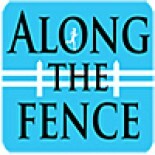 Unfortunately, they have a much tougher road to the MOC and may not be able to prove it head to head. How about a group 4 discussion? I see 7 teams running for 5 spots in the MOC if you assume that both wild cards will come from G4. Who will be left out? Team averages are almost meaningless unless you merge results and even then they don’t mean a lot. Head-to-head competition is what is needed and hopefully we’ll get that in a week and a half. In the meantime I’m not knocking Ridge out of third because of a team average in one race. Need to see more. Hey Joe, how about Shawnee and Haddonfield? I agree with you that team average and merge results are not true indicators because the G4 sectional race was a faster race than G2 at Delsea. I look at Shawnee and they have won every race they have been in this year. Haddonfield does not run in any of the SJ races so the only time that they can meet head to head is at the MOC. That being said, the only data that you can go with is the Delsea results, same day same course. I’m with you, Soranki. Pat can tell you that I’ve been on Shawnee all season, had them ranked in the top ten the whole way. Then the week before the sectionals I dropped them out. Knew I shouldn’t have done that. They labor in obscurity. Haddonfield gets the recognition because of who they are and have been and because of Bri Gess. Shawnee not so much. And I do agree that without more data what do you do? Use what you have. My point was that team averages are not definitive unto themselves. Much better when you use a merge but even that doesn’t account for the way the teams would run head-to-head. We all know nothing substitutes for the real thing and that’s coming up this and the next weekend. Can’t wait to see it. Great point on the “name recognition”, Joe. Hard not to respect what Haddonfield has done over the years. As for head-to-head, Haddonfield will cruise to the MOC and Shawnee will need to survive the G4 meat grinder. What a race that will be! I really hope Shawnee makes it. I don’t know anyone there but it would be great to see them fly under the radar all season then come up big and get to the bid dance. I think Randoph pulls it off and gets one WC. North Hunterdon could sneak in due to potnetial low time from Glasergreen. Of course that is why they run the races and i will probally be wrong! No team is a mortal lock in Group 4 girls. They could all make it and all could be on the outside looking in if the race doesn’t go their way. Ought to be fun. For Group 1. Suesss defeats schaffer in close race. North Warren edges New Providence by less then 10 points. FYI, I sholud have included Clearview for the 8th team as they gave Shawnee all they could handle in the two meets before the sectionals. They could have just had an off day last week. Soranki Shawnee had a great season. No shame at an off race at Groups!. Hope they rise from the ashes to a great season in future years. My daughters team bombed last year when they though they could win. This year they ran a great team race to earn a spot in big dance with limited expectations.. Theyare HS girls not the most consitent creature on the planet. Correct me if I am wrong, but aggregate time does not come into play if they finish 6th. Only the 4th and 5th place teams in each group are eligible for the wild card, correct? That being said, I can see a scenario where NH finishes 6th and still has a better aggregate time than the 4th and 5th place teams. But aggregate is all about having a stud on the team. You get a Gess who finishes 1:00 up on second place you get a nice impact on your team time which means nothing to the number of points scored. It’s all about the competition isn’t it? Seuess beats Schafer in a close race. North Warren beats New Providnece by arouns 10 points. How about yours? Truth, and Pat can verify this, I never, ever make predictions about high school races. Ever. However, I do think you’ve got the right teams when you add in Shore. Predict the Raiders of Hillsborough come back and battle their Somerset rivals right to the end. Maybe a few points separate them again. To the MOC, in order: Ridgewood, Ridge, Hillsborough, WWPS and Randolph. I can’t see Randolph finishing any higher than seventh — the Rams will score too many points with their fifth kid (who would be their seventh). That’s probably 40-50 more than than of the other six teams. (Clearview will be lucky to be in the top 12 IMHO). Don’ discount Hillsborough — Refi always gets his teams fired up for Holmdel!!! What about NPA (after RBC of course) — Is Union Catholic for real? No truer words were ever spoken – never rule out Hillsborough girls. Ever. Joe we disagree on many things but not the greatness of the Hillsboro program. Sensational job by Refki ans those girls. I will be rooting for then to take down RBC if my daughters team can not do it! Pat will tell you i have been commenting in my weekly top ten poll always be wary of Refki teams in November. Kind of like Jim Valvano used to say ifor March Madness “Always be wary of the Double Directionals”. Would not surprise me to see them advance but i do not think they will win. I really hope that they somehow change the criteria for MOC. I think it’s important that the champions of each group move on, but top three is too much. Limit the automatics to the champion and runner up in each group and throw all of the remaining teams in an aggregate time qualifier for the remaining 8. That seems to me to be the right mix and would make for a much more competitive race at MOC. Regardless of the outcomes, we have three dynamite races on tap tomorrow on the girls’ side with Groups 2, 3, and 4. All three races are loaded with good teams. Too much fun!!! Indeed you are right Brian both the team and individual races. Exactly Pat. We are so far away from the insane numbers seen at SCI, and it would be very little added cost to add THREE MORE wildcards to the mix, keeping the auto qualifiers from each Group. This can be accommodated for MOC. What is the counter to adding 21 more kids to the MOC race? And agreed, clearly not ethical or fair to take away the MOC incentives at this stage from kids and coaches from the smaller and NP schools. Pat, I think that is the only idea that will pass the vote. The Varsity Girls A race at Shore Coaches had 25 schools and 170 runners. I was at the tennis court area. I don’t think there were any complaints, although I was not at the top of the hill at the start to see the merging of runners. That is the only spot where there could be a problem. Summit will be the unlucky, but eminently qualified, squad of the week under the current WC system. Pat — we’ll speak tomorrow but my early research is leaning towards adding three wild cards to MOC, not two. Can you tell us more of what you two are working on? adding two or three additional wild cards to the 20 teams already in — no deduction from those already in (three per group). The research is trying to determine if any adjustment should made on the 10 individual wild cards. OK fellers. Enough of this for now. Aside from artificially inflating my page views, it is turning a little too ugly, Steve, for my sensibilities. Any more on this subject and I delete the thread. I warned you to leave it alone. I am really pissed off now. The concern I have is that in the past the NJSIAA has said the there are already too many runners on the line in Holmdel. I don’t subscribe to that position but I am concerned that this suggestion would lead to “well, we could easily accommodate this at Thompson Park”. Otherwise it’s a good idea. Sorry, Austin that was a reply to you. I must have hit the wrong REPLY button. The Raiders! Had a feeling they were laying in the weeds. And congrats for a great run from the team with so much pride and tradition, North Hunterdon. As usual Paul nailed it with Randolph. Congrats to Hillsborough. Great race yesterday. This entry was posted on November 12, 2014 by Patrick Montferrat in 2014 Cross Country.